← Trump’s use of the ludicrous. An emulsion is a composite of two liquids, such as oil and water, that normally cannot mix together. Mayonnaise and many salad dressings, for example, are emulsions. Conceptually, I would also classify the 9/11 Memorial Gift Shop, alongside mayonnaise, as an emulsion. The following are some items you can purchase at the 9/11 WTC Memorial Gift Shop: oval “9/11 Memorial” stickers ($2.50), “Honor and Remember” silicone bracelets ($5.00), 9/11 Memorial Museum Hard Hat Paperweight ($34.94), Memorial Pools Glass Keepsake ($24.00), Survivor Tree Blossom Umbrella ($45.00), a United We Stand Blanket ($225.00). I picked up a sticker and bracelet, but was definitely eyeing the 9/11 Memorial Logo Tumbler Bottle— not so much as a strictly utilitarian object as a conceptual work displaying the queasy incompatibility of solemn observance with the mindlessness of habit. It’s an object with two distinct imperatives: “Never Forget” with “Stay Hydrated.” Conceptual works, at least many of the best ones, mediate contradictions. Not the 9/11 Gift Shop. The demands of a gift shop and the demands of a memorial, unmediated, hang together in a mayonnaise of awkward coincidence. 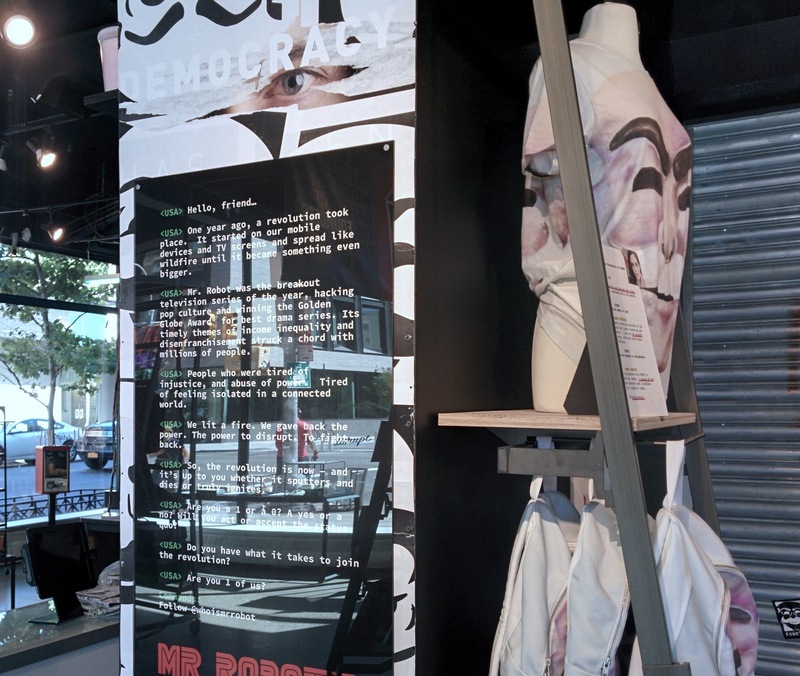 Until a few weeks ago, Chelsea had a hack-the-world, disruption-themed pop-up boutique. Also pure mayonnaise. 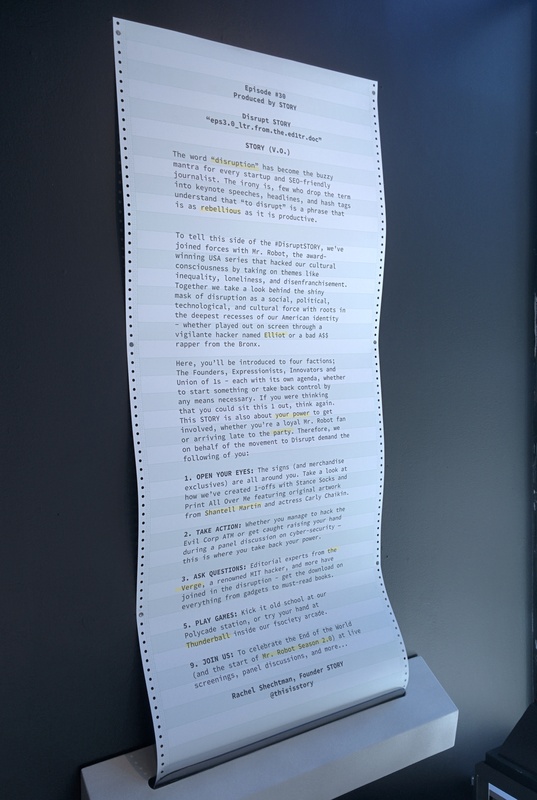 Visitors could fake hack the Evil Corp ATM for a chance at winning real cash, or enjoy a free bottle water in exchange for a hashtag, and after being admonished for trying to pay Evil Corp for water. As Popular Science touts “There’s a store causing a disruption tucked beside The High Line in New York City. And they’re selling light-up sneakers.” Unsurprisingly, the store had a pungent street art thematic and shelves of prefab do-it-yourself products. A third emulsion, closer to vinaigrette in delectation, are “fun” children’s dentists— clinics that have Playstations and ballpits up front, and in the back, adults drilling into the face of an unconscious child. I can imagine a child’s feelings toward these places to be irreconcilable. Emulsions render “critique” pointless. Notice how you wouldn’t have anything to say about the 9/11 Gift Shop or the Disrupt boutique that wouldn’t already sound trite.